Notes: The Blue Tang Surgeonfish is a gorgeous tang found in the Atlantic Ocean. it is a deep-bodied fish that can get quite large. Typical size is about 9 inches, but some specimens can reach a whopping 15 1/3 inches in length. 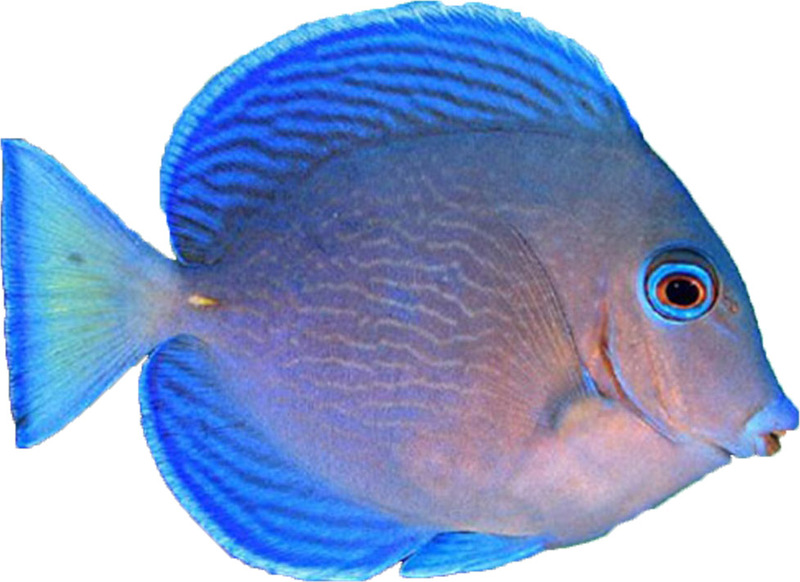 Though not quite as flashy as the two "Blue Tangs" from the Pacific Ocean, it goes through several pretty color stages as it grows. The juvenile is bright yellow with blue edged fins. It then becomes a pastel blue with yellow in the tail fin, like the 2 to 3 inch adolescent seen above. As it begins to mature it turns blue accented with a yellow or white caudal spine. There can be a great variation in size when these fish change to their adult blue, but it is often at about 5 inches. It is also commonly known as the Atlantic Blue Tang, Caribbean Blue Tang, Blue Surgeonfish, Blue Doctorfish, and Yellow Doctorfish. This Blue Tang is a bit more difficult to keep than some of the other surgeonfish, but its beauty makes it a wonderful marine aquarium addition. It is moderately hardy so is a good selection for an intermediate aquarist, however it has requirements that put it just beyond the reach of a beginner. Close attention must be given to its diet and to maintaining good water quality. They need a minimum size tank of 100 gallons to accommodate their size and swimming needs. But a larger aquarium that's taller and 6 foot long, 180 gallons or so, will suit these deep-bodied fish best. Q: Are the atlantic blue fish juvenile(yellow)?